Such a good point. Seriously people, atheism is the absence of religion. Nonexistence is the default; it takes no faith. You (presumably) wouldn't believe any random whack-job claim without proof. Russel's Teapot comes to mind. I'll have to agree to disagree here. 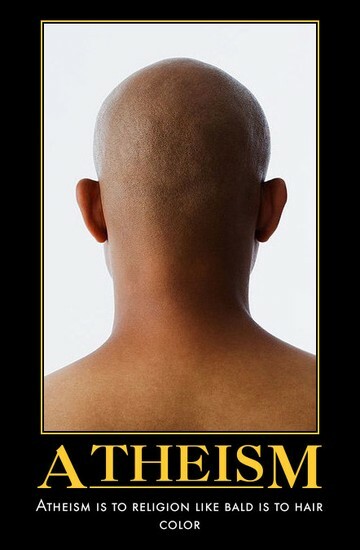 I am religious about atheism. I have complete faith- faith that there is no God. It all depends on what you mean by "faith". Using the word "faith" to describe atheism only gives ammunition to the believers. Sentient atheists all must have faith in the spontaneous generation of the first organism. @ Looney: Ah yes, abiogenesis. I accept that we don't know how it happened yet. There's a lot of things we still don't understand. That doesn't mean that everything we don't currently understand must be the work of an invisible wizard in the sky. Once upon a time it was thought illness was God's punishment. Now we know about bacteria and viruses. Does that mean that it was God's wrath up until we discovered bacteria? Then it suddenly became a natural occurrence once humanity figured it out? Or was it always caused by germs, even when we didn't know about them yet? They are getting closer to explaining it. Comets have been found to contain simple organic molecules. When one collides with the earth at a steep angle, it smashes the molecules together into more complex organic molecules and literally rains them down upon the Earth. All while maintaining temperatures low enough for such molecules to remain intact. I'm not saying this is how it happened, and the scientists have not agreed that this is how it happened. But it's 1 possibility. A possibility that seems infinitely more likely than the spontaneous generation of the far more complex entity that is God. Oh, so there's two kinds of atheism, one where you just don't beleive in God and one where you have beleif that God doesn't exist. I've always been the latter and considered it a religion. I never really thought that if you didn't have the positive beleif in the lack of God, it wasn't atheism. But I guess that would be "weak atheism," and would be a lack of religion, whereas "strong atheism" would be a religion. @Marf, yes there is much that we don't understand. As for evolution explaining things, it is an infinite explaining mechanism: It can explain the relationship of Orcs to Elves, Klingons to Romulons, and any other pair of items one cares to imagine. An interesting feature is that evolutionary explanations are never unique: There are an infinite number of evolutionary scenarios that can be created between any two species, such as humans and apes, or ravens and squids. It is quite a curious bit of science! @ Vid: I wouldn't use the terms strong and weak like that, because those already have a defined meaning. Weak atheism is disbelief in God, but perhaps you believe in spirits, or an afterlife of some kind. Strong atheism is disbelief in anything supernatural.